I didn’t intend to make grape jelly yesterday but after seeing these beautifully plump Coronation grapes at the market, I couldn’t resist. The grapes were grown locally and were also on sale so I just couldn’t say no. It’s only in the past few years that I’ve started to make my own jams and preserves. Most recently I made blueberry jam which I still haven’t gotten around to posting (and I’m already on my last jar!) I like knowing what’s in my food and I can control the ingredients when making my own preserves. This jelly is simple to make, perfect for a beginner. 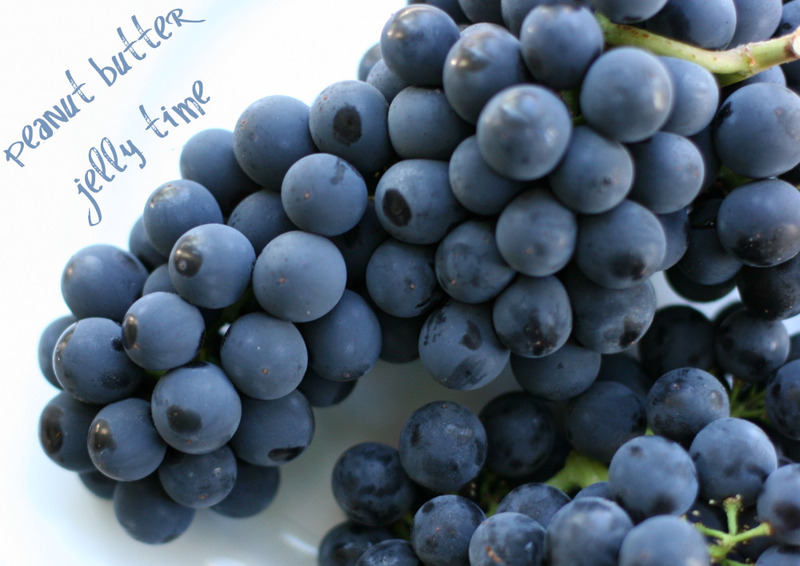 Smash grapes or chop using a food processor. Place into a large pot with the water. Bring to a boil, then cover and reduce heat. Simmer for 10 minutes.
. I used a strainer. It you seek a crystal clear jelly then using a jelly bag would be the best option. Small bits of the grapes may push through the strainer leaving the jelly slightly cloudy. I like the rustic look (and let’s face it, it’s much less fussy). Place 5 cups grape juice and pectin into a large pot. Bring to a boil, then slowly stir in sugar. Return mixture to a rolling boil for one minute, then remove from heat. Use a large spoon to skim any froth off the top. You may now cool or can the jelly at this point. I opted to can 3 pints and had nearly another pint to place in the fridge for immediate use. Fortunately, the grapes yielded about 6 cups of juice so I used the remaining cup juice to make a delicious drink. I added the remaining juice to a pitcher with a few tablespoons of sugar and enough water to dilute to the desired taste. Coronation grapes are rampant at the farmers markets right now!! Just came back from a food and wine writers conference in the Okanagan, where we learned that the Coronation grape was bred in Summerland. We got to taste a few right off the vine, warming in the sun. What an unforgettable sweet flavor burst! If you have any more you might want to try a galette – we ate a superb one from the Penticton farmer’s market, from Joy Road Catering. Or maybe use the jam to make a crostata? That sounds good too. Your jam must be extremely flavorful, based on the taste of that grape. This is the first year I canned, first thing I made was grape jam. Such a delicious way to prolong the flavor of late summer! What kind of pectin did you use? Liquid or powdered? If liquid, one package or one pouch? I want to start making jelly using fruit instead of wine or peppers, but I’m not brave enough yet! Are you seriously telling me you made homemade grape jelly?! That is tremendous! I can’t even imagine how much better that must taste than Smucker’s. I am proud of my jelly, even though it’s a very basic recipe. It tastes so much better than store bought jelly! Then again, maybe it’s just my biased viewpoint. Emily: as for the pectin, I used powdered (sorry, don’t remember brand name). The package was a small box like the size of a box of jell-o. Hannah: I certainly think you could add some of the pulp back into the mix. It would then be more jam-like instead of jelly … but I’m not a stickler for labels ;-) I bet the added texture would be good! Thanks, Allen! I’ve got an order for honey bourbon jelly to fill, so since I’ll already be making jelly that would be a perfect time to try making yours! FYI: I forgot that I HAVE done fruit before, but it was marmalade (from one of your posts), so I guess that counts!